Th17 cells are involved in the defense against bacteria and fungi and play a prominent role in the pathogenesis of autoimmune diseases, but research on human Th17 cells is hindered due to the lack of a surface marker. In this study, we report that a subset of human and mouse CD4+ T cells as well as human Th17 T cell clones express IL-17A on their surface upon stimulation. Correlation of surface IL-17A expression with intracellular IL-17A production and with RORγt mRNA expression identified surface IL-17A as a specific marker for human and mouse Th17 cells. Phenotype characterization of ex vivo CD4+ IL-17A+ cells showed that the chemokines CCR6 and CCR4, costimulatory molecules, as well as CD2 and CD49d were more prominently expressed on these cells than in surface IL-17A− cells, supporting the concept of Th17 cells as a potent inflammatory effector subtype. In addition, we generated human Th1, Th1/17 (producing both IFN-γ and IL-17A), and Th17 T cell clones based on single cell sorting of surface IL-17A−, IL-17Aint, and IL-17Ahigh CD4+ T cells, respectively, and showed the plasticity of the double producing clones to the cytokine milieu. The identification of surface IL-17A as a marker for Th17 cells should facilitate research on this subset. IL-17 is a potent inducer of inflammation by triggering the release of cytokines and chemokines from a broad range of stromal cells (1). Through its regulation of proinflammatory gene expression, IL-17A has the capability to recruit neutrophils (2) and to promote antimicrobial protein synthesis (3). Until now, six structurally related isoforms for IL-17 (IL-17A, B, C, D, E, and F) have been identified and grouped into the IL-17 cytokine family (4, 5, 6). Among them, IL-17F has the highest homology with IL-17A. Both IL-17A and IL-17F are active as homodimers and can form biologically functional IL-17A/IL-17F heterodimers (7). IL-17A and IL-17F are produced by CD4+ T cells, γδ T cells, NKT cells, NK cells, CD8 cells, neutrophils, and eosinophils (1, 8, 9, 10, 11, 12, 13). IL-17A-producing CD4+ T cells, defined as Th17 cells, have been recently identified as a distinct Th cell lineage (14), which differentiates upon stimulation from naive CD4+ T cells in presence of TGF-β and IL-6 (15, 16, 17). Maintenance of Th17 cells requires in addition IL-23 (18), and they express the lineage-specific transcription factor RORγt (19). In contrast, Th1 cell differentiation requires IL-12 and the expression of the transcription factor T-bet (20), while Th2 cells are dependent on IL-4 and the expression of GATA-3 (21). The existence of Th1/17 cells, producing both IL-17A and IFN-γ, suggests that commitment to a specific effector type might be more flexible than previously assumed. Th17 cells have been linked to the pathogenesis of several inflammatory (22, 23) and autoimmune diseases (24, 25, 26) and therefore they are under intense investigation. Although reporter lines allow tracking of Th17 cells in mice, human Th17 cells are currently identified ex vivo by intracellular IL-17 expression, which does not allow further functional analysis. Alternatively, Th17 cells can be differentiated in vitro from naive CD4+ T cells using combinations of cytokines, but culture conditions may change their properties. We report in this study the unambiguous identification of Th17 cells by the expression of surface IL-17A. Using surface IL-17A as a marker, we could phenotypically characterize ex vivo human Th17 cells and generate Th17 and Th1/17 T cell clones (TCC).3 Furthermore, we show for the first time in human cells the plasticity of the Th1/17 cells in response to the cytokine milieu. Peripheral blood was taken from healthy donors after informed consent under a protocol approved by the local ethics committee. CD4+ cells were isolated (>95% purity) from PBMC by negative selection using the CD4+ T Cell Isolation Kit II (Miltenyi Biotec) according to manufacturer’s instructions. Th1 and Th17 TCC were generated from PBMC by limiting dilution (27). Clonality was assessed by TCR Vβ-chain staining (28). For the isolation of surface IL-17A+ cells, CD4+ T cells were stimulated with 50 ng/ml PMA and 1 μg/ml ionomycin for the indicated time period, stained with anti-IL-17A Alexa647 (eBio64DEC17, eBioscience), and FACS sorted or isolated using anti-Cy5/Alexa Fluor 647 Microbeads (Miltenyi Biotec). To induce a Th17 response, C57BL/6 wild-type or IL-17R-deficient mice (29) (provided by Amgen) were immunized with 200 μg MOG35–55 (NeoMPS) in CFA supplemented with 4 mg/ml Mycobacterium tuberculosis H37RA (Difco Laboratories), followed by injection of 300 ng pertussis toxin (Sigma-Aldrich) at the time point of immunization and repeated 2 days later. After 12 or 25 days, CD4+ T cells were isolated from spleen and from the spinal cord and brain of the immunized mice as described before (30) by magnetic isolation (Miltenyi Biotec) and used for staining. All experiments involving animals were performed according to the German animal protection act and have been approved by local authorities. The following anti-human Abs were used: anti-CD4 Pacific Blue (clone MT310, DakoCytomation), anti-IFN-γ PE, (clone 4S.B3), anti-IL-17A Alexa647 (clone eBio64DEC17), anti-IL-17F PE (clone SHLR17), anti-ICOS FITC (clone ISA-3), anti-CD25 PE (clone 12–1278-73), anti-CD28 PE-Cy7 (clone CD28.2), anti-CD39 PE-Cy7 (clone 25–0399), anti-programmed cell death 1 (PD-1) FITC (clone U116), CD127 PE (clone 12–1278-73), CD45RO FITC (clone 11–0457-73) (all eBioscience), anti-CD6 FITC (clone 559491), anti-CCR6 PE (clone 11A9), anti-CTLA-4 PE (clone BNI3), anti-CD2 FITC (clone RPA-2.10), anti-CD25 PE (clone M-A251), anti-CD5 FITC (clone UCHT2), anti-CD62L PE (clone L48), anti-CD49d PE (clone 9F10), anti-CD28 PE (clone 555432), anti-CD14 Pacific Blue (clone 558121), anti-CD122 PE (clone 554525), anti-CD132 PE (clone 555900), anti-CD161 PE (clone HP-3G10) and isotype-matched control mAbs (all BD Biosciences), anti-IL-17R PE (clone 133617), anti-CCR4 FITC (clone 205410), anti-CCR5 PE (clone 45531) (all R&D Systems), and anti-CD27 Alexa750 (clone MHCD2727, Caltag). For the mouse staining protocol, we used anti-CD4 PE (GK1.5), CD11b FITC (M1/70), CD45 PE-Cy7 (30-F11), and anti-IL-17A Alexa647 (eBio17B7, all eBioscience). For assessment of surface expression, cells were stained at different time points after PMA/ionomycin stimulation. For intracellular cytokine staining (ICS), cells were stimulated with PMA/ionomycin in the presence of brefeldin A (10 μg/ml, eBioscience) for 6 h and subsequently fixed and permeabilized with the corresponding buffers (eBioscience). Samples were analyzed in the LSRII flow cytometer using the DiVa software (BD Biosciences), and results were evaluated using the FlowJo software (Tree Star). The resulting mean fluorescence intensity (MFI) was obtained after subtracting the MFI of the isotype control from the MFI of the Ab of interest. For cell sorting we used a FACS Aria (BD Biosciences). MACS- or FACS-sorted surface IL-17A+ and surface IL-17A− cells were cultured as a bulk in X-VIVO 15 or IMDM supplemented with 5% human serum, respectively, for 10 to 14 days. IL-17A production was assessed by ICS 10 days after each restimulation and the supernatants monitored by ELISA (human IL-17A ELISA kit, eBioscience). CD4+ T cells were stimulated 6 h with PMA/ionomycin and subsequently stained with anti-IL-17A Alexa647. Surface IL-17A−, IL-17Aint, or IL-17Ahigh CD4+ T cells were sorted at one cell per well onto 96-well culture plates containing IMDM supplemented with 5% human serum, 20 U/ml hrIL-2 and irradiated autologous PBMC (FACSAria, BD Biosciences). Cells were restimulated every second week. Cytokine production and clonality were assessed by ICS and TCR Vβ staining, respectively. To assess the plasticity of the mixed clones, 2 × 104 cells were cultured in X-VIVO15 with 2.5 μg/ml PHA (Sigma-Aldrich) and irradiated feeder cells in the presence of 50 ng/ml human rIL-12 or rIL-23 (both R&D Systems). After 7 days, production of IFN-γ and IL-17A was assessed by ICS. RNA was isolated from magnetic bead-isolated IL-17A Alexa647+ (containing surface IL-17A+ CD4+ cells) and Alexa647− (containing surface IL-17− CD4+ cells) fractions or from Th17, Th1, and Th1/17 TCC after overnight PMA/ionomycin stimulation. After reverse transcription, gene expression was analyzed by real time-PCR (ABI Prism 7900, Applied Biosystems). The following primer and probe sets were purchased from Applied Biosystems: T-bet (TBX21 Hs00203436_m1), RORγt (RORC2 Hs01076112_m1), GATA-3 (Hs00231122_m1), FOXP3 (Hs01085834_m1), IL-17A (Hs99999082_m1), and IL-23R (Hs00332759_m1), IL-17R (Hs01064648_m1). Primer pairs for the other genes are as follows: TGF-β for 5′-GCCCTGGACACCAACTATTG-3′; TGF-β rev 5′-CTGGTCCAG GCTCCAAAT-3′, and IFN-γ for 5′-TTCAGCTCTGCATCGTTTTG-3′; IFN-γ rev 5′-CTTTCCAATTCTTCAAAATGCC-3′. Samples were run in duplicates, 18S rRNA was used as endogenous control and the relative gene expression was calculated by the ΔΔCt method using CD4+ T cells as calibrator. Purified CD4+ T cells were stimulated overnight with PMA/ionomycin. Cells were then washed with PBS and surface molecules were first biotinylated and subsequently isolated using the cell surface protein isolation kit (Pierce) according to the manufacturer’s protocol. Collected fractions, eluate (biotinylated proteins), and flow-through (intracellular proteins) were separated by SDS gel electrophoresis under reducing conditions and blotted onto polyvinylidine difuloride membrane. Membranes were incubated with polyclonal rabbit anti-IL-17A and anti-IL-17F (both PeproTech), mouse anti-GAPDH (6C5, Abcam) overnight at 4°C, followed by anti-rabbit or anti-mouse HRP-coupled secondary Ab (Sigma-Aldrich), respectively. Nonbiotinylated cell lysates and human rIL-17A and rIL-17F (both PeproTech) were used as controls. Blots were developed using the ECL Plus system (Amersham Biosciences). Transmembrane prediction using hidden Markov models (TMHMM) (31) and membrane protein identification without explicit use of hydropathy profiles and alignments (MINNOU) (32) were used to predict transmembrane domains. The sequences used were AAH67505 for IL-17A and AAH70124 for IL-17F. Two-tailed unpaired Student’s t test was use to compare surface marker expression between surface IL-17A+ and surface IL-17A− cells. Differences were considered significant if p ≤ 0.05. Although trying to identify human IL-17A-producing CD4+ T cells using a cytokine-capture/detection system, we observed that the anti-IL-17A detection Ab was binding to ∼1% of CD4+ T cells even in the absence of the capture anti-IL-17 Ab, indicating that IL-17A was expressed on the membrane of some activated CD4+ T cells. To verify this finding, we stimulated purified CD4+ T cells with PMA/ionomycin and stained the surface for IL-17A. Flow cytometry analysis revealed that IL-17A was displayed at the surface of a small population of CD4+ T cells (0.89% ± 0.10, n = 11) (Fig. 1⇓A), in all donors tested. Unstimulated cells and cells treated with brefeldin A were completely devoid of surface IL-17A (data not shown), suggesting that active transport from the endoplasmic reticulum to the cell surface is required for membrane expression of IL-17A. After PMA/ionomycin stimulation, the percentage of cells expressing IL-17A on the surface was maximal at 6 h and declined steadily to minimum levels after 48 h of stimulation (Fig. 1⇓B), and always correlated with the frequency of IL-17A-producing cells detected by ICS. Surface IL-17A expression was also detected on CD4+ T cells isolated from the spleen and the CNS of immunized mice 6 h after PMA/ionomycin stimulation (Fig. 1⇓C), but again not in unstimulated cells or in the presence of brefeldin A. In the CNS, the proportion of CD4+ T cells with intracellular IL-17A was 24.09%, and the frequency of surface IL-17A-positive cells was 24.07%, indicating that surface IL-17A faithfully reflects the presence of IL-17A-producing cells in different compartments. 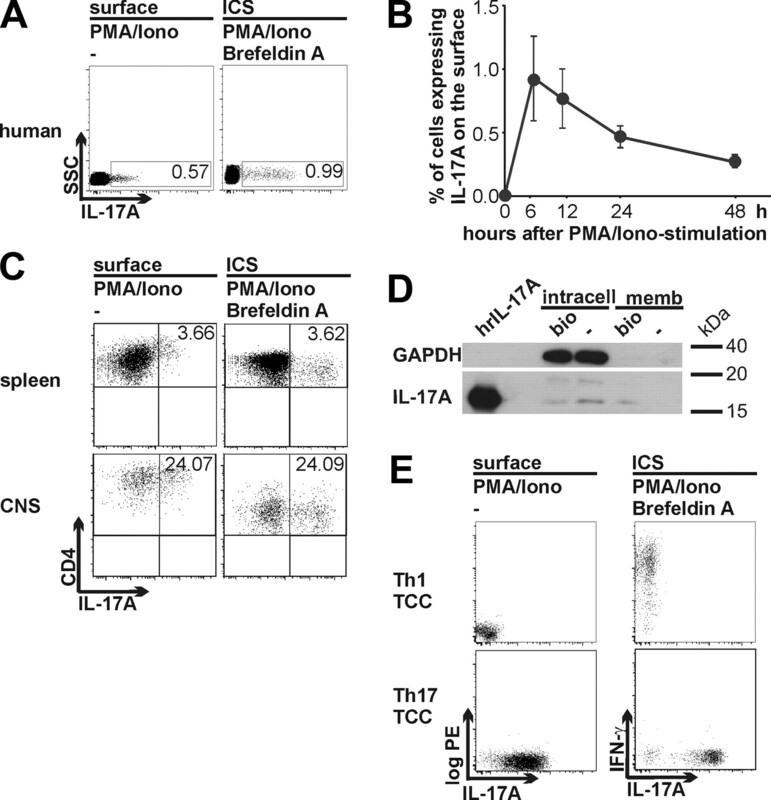 Moreover, biotinylation of cell surface proteins confirmed the presence of IL-17A on the cell membrane of PMA/ionomycin-stimulated human CD4+ T cells (Fig. 1⇓D). IL-17A is displayed on the cell surface of a subset of human and mouse CD4+ T cells and in Th17 TCC. A, Purified human CD4+ T cells were stimulated with PMA/ionomycin and stained 6 h later with anti-IL-17A without cell permeabilization (left) or after permeabilization (right). Brefeldin A was added 1 h after stimulation where indicated. The numbers in the plots indicate the percentage of CD4+ T cells expressing surface IL-17A (left) and of intracellular IL-17A (right). Data are representative of eleven experiments. B, Time course of surface IL-17A expression. Purified CD4+ T cells were stimulated with PMA/ionomycin for the indicated time points and stained for surface expression of IL-17A. The graph shows the mean percentage ± SEM of surface IL-17A+ cells at each time point (n = 3). C, Purified mouse CD4+ T cells isolated from spleen (top) and from the CNS (bottom) 25 days after MOG35–55 immunization were stimulated with PMA/ionomycin and stained and analyzed as in A. Data are representative of three experiments. D, Detection of IL-17A in the intracellular and isolated membrane fraction of membrane-biotinylated and nonbiotinylated PMA/ionomycin-stimulated human CD4+ T cell lysate. Human rIL-17A was used as positive control and GAPDH as a loading control for intracellular proteins. E, Resting Th1 (top) and Th17 (bottom) TCC were stimulated overnight with PMA/ionomycin and stained for surface IL-17A (left) or after permeabilization (right). Brefeldin A was added for intracellular cytokine detection. Data are representative of eight clones. To assess whether all IL-17A producing CD4+ T cells also express IL-17A on their cell surface, we analyzed surface IL-17A expression on Th1 and Th17 TCC that we had previously generated (V. Brucklacher-Waldert, K. Stürner, M. Kolster, J. Wolthausen, and E. Tolosa; submitted for publication). We found that all Th17 TCC displayed high amounts of IL-17A at the surface, while none of the Th1 TCC did (Fig. 1⇑E). Th1/17 clones, producing simultaneously IFN-γ and IL-17A also expressed surface IL-17A at the cell surface, although the intensity of the staining was lower than for bona fide Th17 TCC (data not shown). We performed the following experiments to demonstrate that surface IL-17A positive CD4+ cells are indeed Th17 cells. First, we separated CD4+ T cells on the basis of their surface IL-17A expression using magnetic beads (Fig. 2⇓, A and B), or FACS sorting (Fig. 2⇓C) and analyzed the positive and negative fractions for the expression of T cell lineage specific transcription factors. Surface IL-17A+ CD4+ T cells expressed RORγt mRNA, while this transcription factor was barely detectable in surface IL-17− CD4+ T cells. T-bet, by contrast, was expressed at similar levels by Th1 and Th17 TCC (Fig. 2⇓B), as already described (26). Second, after 10 days expansion of the purified subsets, we analyzed the surface IL-17A+ sorted subset by ICS and still found 35.5% of Th17 cells (Fig. 2⇓C). As expected, <1% of the expanded surface IL-17A− population contained Th17 cells. Finally, we measured IL-17A in the supernatants of surface IL-17A+ and surface IL-17− populations during PMA/ionomycin expansion. 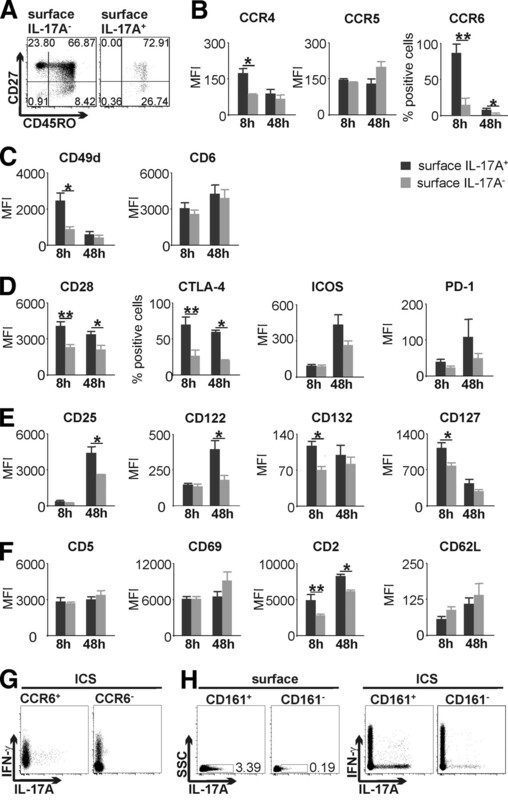 IL-17A could be detected in the supernatant of the surface IL-17A+ fractions for nearly 2 wk after restimulation, whereas surface IL-17− cells production was negligible (Fig. 2⇓D). In summary, the expression of RORγt and the stable production of IL-17A by expanded surface IL-17A+ cells identified surface IL-17A+ cells as Th17 cells. Surface IL-17A-expressing CD4+ T cells are Th17 cells. A, Isolated CD4+ T cells were stimulated overnight with PMA/ionomycin, surface stained with anti-IL-17A Alexa647, and subsequently purified using magnetic beads coupled to anti-Alexa647 Abs. The dot plots show the surface staining for IL-17A in the original fraction before MACS (left), in the negative fraction (middle), and in the positively selected fraction (right). The numbers in the plots indicate the percentage of surface IL-17A+ cells in comparison to the isotype control. B, RORγt and T-bet mRNA expression analysis of the surface IL-17A+ and surface IL-17A− fractions immediately after purification (n = 3). Data are shown as mean ± SEM. C, PMA/ionomycin-stimulated CD4+ T cells (left) were sorted according to their surface IL-17A expression and cultured as bulk in the absence of polarizing cytokines. After 10 days, surface IL-17A− cells (upper panel) and surface IL-17A+ cells (lower panel) were stained for intracellular cytokines. D, Detection of IL-17A in the supernatant of MACS-isolated surface IL-17A+ (black line) and surface IL-17A− (gray line) at the indicated time points after magnetic isolation. The expression levels of surface molecules in ex vivo Th17 cells could be easily analyzed using surface IL-17A as a marker. We stimulated CD4+ T cells with PMA/ionomycin and analyzed expression of surface markers 8 h after stimulation, when surface IL-17A expression is maximal, and again after 48 h, when cells are fully activated (Fig. 3⇓, supplemental Fig. 1).4 Flow cytometric analysis showed that surface IL-17A+ cells are exclusively CD45RO+ memory cells, whereas surface IL-17A− cells were in average 69.07% ± 9.82 CD45RO+ memory cells, 30.13% ± 9.95 CD45RO−CD27+ naive T cells and 0.8% ± 0.28 CD45RO−CD27− effector cells (n = 4), representing altogether not only other polarized cells, but also the naive compartment (Fig. 3⇓A). ). Data are displayed as the average MFI or percentage of positive cells as indicated (n = 4). G, sorted CD4+CCR6+ and CD4+CCR6− T cells were independently stimulated with PMA/ionomycin and stained intracellularly for IFN-γ and IL-17A. H, sorted CD4+CD161+ and CD4+CD161− cells were independently stimulated with PMA/ionomycin and stained for surface IL-17A (left) and intracellularly for IFN-γ and IL-17A (right). Next, we analyzed molecules involved in the recruitment into inflammatory tissues. We found that surface IL-17A+ CD4+ T cells expressed significantly more CCR4, as reported for Th17 cells (26, 33, 34), while CCR5 expression was comparable in both populations (Fig. 3⇑B). As expected, CCR6 was expressed significantly higher on surface IL-17A+ cells than on surface IL-17A− cells (Fig. 3⇑B) (26, 33, 34). CCR6 expression was highest after 8 h of stimulation and was later down-regulated. Although nearly all of the IL-17A+ cells were CCR6+, only <20% of the IL-17A− population expressed this chemokine receptor. To assess whether sorting of CD4+ T cells on the basis of CCR6 expression would generate exclusively Th17 cells, we sorted CCR6+CD4+ and CCR6−CD4+ T cells and analyzed both subsets immediately for intracellular production of IFN-γ and IL-17A. We found that IL-17A-producing cells were exclusively present in the CCR6+ subset, whereas IFN-γ producing CD4+ T cells could be detected in both CCR6+ and CCR6− populations (Fig. 3⇑G), indicating that CCR6 is not an exclusive marker for Th17 cells. We next analyzed the differential expression of molecules involved in adhesion to endothelial tissue. CD49d was expressed at much higher levels on surface IL-17A+ cells early after activation, whereas CD6, the ligand for activated leukocyte cell adhesion molecule-1, expression was comparable in both subsets (Fig. 3⇑C). Proliferation and survival of T cells depend on the combination of signals provided by costimulatory molecules. Although CD28 is constitutively present in most T cells, CTLA-4 (CD152) is up-regulated relatively late after activation. We found that expression of CD28 was significantly higher in surface IL-17A+ cells compared with surface IL-17A− cells both 8 and 48 h after activation (Fig. 3⇑D). Remarkably, the T cell proliferation inhibitor CTLA-4 was expressed by nearly 70% of the surface IL-17A+ cells already at the early activation time point (supplemental Fig. 1), suggesting constitutive CTLA-4 expression in Th17 cells. In contrast, CTLA-4 expression in surface IL-17A− cells was expressed at lower levels, and stayed low after 48 h of stimulation. Two further members of the CD28 family, ICOS and PD-1, were expressed at low levels after 8 h and showed after 48 h stimulation a higher expression on surface IL-17A+ cells (Fig. 3⇑D). The receptors for the T cell growth factors IL-2 and IL-7 were also compared between surface IL-17A− and surface IL-17A+ cells (Fig. 3⇑E). CD25 (IL-2Rα-chain) was barely detectable in both cell subsets 8 h after stimulation, but was up-regulated after 48 h, and at a higher extent in the surface IL-17A+ compartment. CD122 (IL-2Rβ-chain) was also up-regulated later after activation, and more noticeably in the surface IL-17A+ cells, whereas CD132 (IL-2Rγ-chain) was up-regulated in the same cells already 8 h after stimulation. CD127, the IL-7Rα-chain, was constitutively expressed in all T cells except regulatory cells, and down-regulated upon activation. The levels of CD127 were slightly higher also in Th17 cells (Fig. 3⇑E). Finally, we investigated T cell activation markers. The early activation markers CD5 and CD69 were expressed at comparable levels in both populations, while the T cell-APC contact promoting CD2 was expressed at significantly higher levels on surface IL-17A+ cells than on surface IL-17A− cells. CD62L (L-selectin), which is down-regulated after activation, was expressed at similarly low levels in both (Fig. 3⇑F). It has been recently published that Th17 cells express CD161, a C-lectin present on NK cells (35). We checked for coexpression of CD161 and surface IL-17A, however, because CD161 is down-regulated upon activation and surface IL-17A only appears after stimulation, it was not possible to prove directly that both molecules are coexpressed. We then sorted CD161 negative and positive cells, stimulated them with PMA/ionomycin, and proceeded with IL-17A staining. Surface IL-17A+ cells are mostly contained in the CD161+ subset (3.39% in contrast to 0.19% in the CD161- subset), similar to Th17 cells defined by cytoplasmic expression of IL-17A. In contrast, Th1 cells are similarly distributed in the CD161− and CD161+ compartments (16.5 and 13%, respectively) (Fig. 3⇑H). Altogether, our results indicate that surface IL-17A+ cells show a higher level of basal activation, and also express higher levels of costimulatory and adhesion molecules than cells expressing no IL-17A. In addition, we show that surface IL-17A+ are contained in the CCR6+ and CD161+ fractions of CD4+ T cells. As mentioned above, we have observed that bona fide Th17 TCC express high amounts of IL-17A on their surface whereas Th1/17 TCC, producing simultaneously IL-17 and IFN-γ, express less surface IL-17A and Th1 clones are devoid of surface IL-17A. To test whether we could generate TCC with different effector phenotypes from cells expressing different levels of surface IL-17A, we sorted surface IL-17A−, surface IL-17Aint, and surface IL-17A+ cells onto 96-well plates at one cell per well (Fig. 4⇓A). After restimulation, the cytokine profile and clonality of these cells lines were analyzed. Intracellular cytokine staining showed that surface IL-17A− cells gave rise exclusively to Th1 cell lines (n = 13), while surface IL-17Ahigh resulted in 13 Th17 cell lines and three T cell lines producing both IL-17A and IFN-γ. In contrast, cells expressing intermediate levels of IL-17A generated 15 Th1/17 double-producing cell lines and three Th1 cell lines. We assessed the TCR Vβ from eight selected Th1/17 cell lines and, after confirming their clonality, used them for further studies. As shown in Fig. 4⇓A, some of these Th1/17 TCC contained individual cells producing either IFN-γ or IL-17A or both cytokines simultaneously (TCC 051 and TCC 049), while some clones gave rise to cells producing only IFN-γ and cells producing both cytokines (TCC 045) and finally some TCC had individual cells producing only IL-17 and cells producing both cytokines (TCC068). To determine whether the heterogeneous cytokine profile of Th1/17 clones cells was mirrored at transcriptional level, we performed RT-PCR analysis of the relevant transcription factors and cytokines (Fig. 4⇓B). As expected, bona fide Th17 clones expressed RORγt and IL-17A mRNA, while Th1 TCC were negative for both of them and expressed instead IFN-γ. T-bet was equally expressed in Th1 and Th17 TCC, as we had already seen in ex vivo Th17 cells. The receptor for IL-23, a cytokine involved in the maintenance of Th17 cells, was undetectable in Th1 TCC, but clearly present in Th17 TCC. Remarkably, Th1/17 clones expressed the highest levels of RORγt, IL-17A and IL-23R, but also of IFN-γ, T-bet, and FOXP3. The Th2 cell specific transcription factor GATA-3 was equally expressed at low levels in all TCC. By following up the sorted TCC over several rounds of restimulation, we observed that, in the absence of cytokines, the phenotype of Th1 and Th17 TCC remained stable, while Th1/17 clones changed their cytokine profile toward less IL-17A and more IFN-γ production, suggesting that they are in a transitional phase rather than being a stable phenotype (Fig. 4⇓C). We addressed their capacity to respond to environment by culturing these cells in the presence IL-23 or IL-12, cytokines that promote or stabilize the development of Th17 and Th1 cells, respectively. As shown in Fig. 4⇓D, IL-23 moderately increased the percentage of cells producing IL-17A, whereas the Th1 cell-promoting IL-12 markedly decreased the expression of IL-17A and increased that of IFN-γ. IFN-γ production by Th1 TCC was not drastically affected by either the addition of IL-23 or IL-12, while addition of IL-12 to the Th17 TCC resulted in the decrease of cells producing solely IL-17A and a corresponding increase in the percentage of double producers. Thus, Th1/17 and Th17 clones respond to changes in their cytokine environment. ), Th17 (n = 3, ▪), and Th1/17 (n = 4, □) TCC generated in A. Data are shown as mean ± SEM. C, Cytokine profile of two double producer Th1/17 clones (TCC121 and TCC062) after consecutive restimulations in the absence of polarizing cytokines. D, Cytokine profiles of two double producers Th1/17 TCC (TCC157 and TCC099), one Th1 (TCC011), and one Th17 (TCC323) after three restimulations in the presence of IL-12 or IL-23. Cytokines can be displayed on the cell surface either bound to a receptor or directly anchored at the cell membrane by means of a transmembrane domain. First, we looked for expression of the IL-17R that could present IL-17A on the surface of CD4+ T cells. Flow cytometry analysis revealed that all monocytes expressed IL-17R, while only a minority of unstimulated (Fig. 5⇓A) and PMA/ionomycin-stimulated (data not shown) human CD4+ T cells expressed IL-17R on their membrane. When stimulated cells were double stained for surface IL-17A and IL-17R, we found no coexpression of the two molecules (Fig. 5⇓B). In addition, blocking of the IL-17R by anti-IL-17R Abs did not prevent surface IL-17A expression (data not shown). PCR analysis of TCC showed similarly low expression of IL-17R in both Th17 and Th1 cells (Fig. 5⇓C). Moreover, surface IL-17A expression could also be detected in CD4+ T cells of the IL-17R-deficient mice (Fig. 5⇓D). These results suggest IL-17A is not bound to the IL-17R. Next, we predicted potential transmembrane domains using the TMHMM and MINNOU programs and revealed that IL-17A generally lacks a transmembrane domain and appears to be a soluble protein (Fig. 5⇓E). Given that IL-17A is functional in vivo as a heterodimer of IL-17A and IL-17F (7, 36), we tested the presence of a transmembrane domain in the IL-17F sequence. Interestingly, IL-17F contains a sequence compatible with a classical transmembrane domain, as predicted by TMHMM and MINNOU (Fig. 5⇓E). Analysis of PMA/ionomycin-stimulated Th17 TCC showed that Th17 cells express IL-17F in addition to IL-17A (Fig. 5⇓, F and G). More definitively, we found IL-17F expressed on the surface of a subset of CD4+ T cells (Fig. 5⇓H). Simultaneous surface staining of IL-17A and IL-17F did show very dim staining of both molecules when compared with the individual stainings, and coexpression was not detectable (data not shown), possibly because of sterical hindrance of anti-IL-17A and anti-IL-17F Abs due to a spatial association of both cytokines. To overcome this problem, we sorted CD4+ T cells into surface IL-17A+ and IL-17F+ cells. After 10 days to allow cells to rest, both sorted populations were stimulated again with PMA/ionomycin and subsequently stained with the two Abs (single staining for the surface, double staining for the cytoplasm, Fig. 5⇓H). Sorted IL-17A+ cells were clearly positive for both IL-17A, and at a lesser extent, for IL-17F, while IL-17A− cells were negative for both IL-17 molecules, both in the surface and in the cytoplasm. The reciprocal experiment showed similar results, although the levels of expression of the IL-17A and IL-17F molecules were lower. Intracellular staining of both sorted IL-17A+ and IL-17F+ populations showed that the majority of cells coexpress intracellularly both cytokines. Remarkably, in some cells, only IL-17A could be detected intracellularly, possibly because anti-IL-17A and anti-IL-17F Abs compete on already dimerized IL-17A/IL-17F complexes. In sorted IL-17− cells neither IL-17A nor IL-17F were detected on the surface or intracellularly. Even though we cannot discard that IL-17A is bound to a yet unknown IL-17R or is in association with other members of the IL-17 family, our data support the hypothesis that IL-17A is transiently displayed at the cell surface forming a heterodimer with membrane-bound IL-17F.
) staining. The dot plot shows the intracellular staining for both cytokines for each population. We report in this study that both IL-17A and IL-17F are displayed on the cell surface of a subset of activated CD4+ T cells. The expression of surface IL-17A correlates with intracellular IL-17A expression in human and murine CD4+ T cells in different compartments, however, there is always some degree of discrepancy between the percentage of positive cells in the surface and the intracellular staining. Indeed, the MFI of the surface staining is always lower than intracellular, probably indicating that there are less IL-17A molecules present at the cell surface than inside the cell. In the first case, IL-17A is only transiently expressed on its way to secretion, while the amount of intracellular IL-17A is artificially enhanced by brefeldin A, which blocks the transport to the cell surface. The lower MFI results in less resolution between positive and negative cells, and thus in differences in the percentages. IL-10 and IFN-γ have also been described on the surface of activated T cells in the absence of a specific receptor (37, 38). However, in both cases a sensitivity-enhancing staining method was required for detection, probably due to a very low expression, while surface IL-17A can be detected by conventional flow cytometry using commercially available fluorochrome-labeled anti-IL-17A Abs. Our data show that the surface IL-17A+ cells are bona fide Th17 cells, and thus surface IL-17A can be used as a specific surface marker for this Th subset. Moreover, we have used surface IL-17A for the isolation of ex vivo Th17 cells by magnetic- and fluorescence-activated cell sorting. A method for ex vivo isolation of human Th17 cells using a bispecific Ab against CD45 and IL-17A for capturing IL-17-secreting cells has been recently reported (39). However, this method requires previous preparation of reagents, needs long handling times, and has the risk of unspecific bystander detection. Using surface IL-17A expression as a marker for Th17 cells, we have analyzed the ex vivo phenotype of this subset in human peripheral blood in comparison to IL-17A-negative cells. The higher expression and up-regulation of CD2, costimulatory molecules, activation markers, and of CD49d on surface IL-17A+ indicates that Th17 cells are better equipped for recruitment into inflamed tissues, activation, and proliferation. Higher expression of CCR6, CD49d, CD28, CTLA-4, CD25, and CD2 was also observed in Th17 TCC when compared with Th1 TCC generated from peripheral blood and cerebrospinal fluid of a patient with multiple sclerosis (V. Brucklacher-Waldert, K. Stürner, M. Kolster, J. Wolthausen, and E. Tolosa; submitted for publication), supporting the view of Th17 cells as a potent effector T cells subset. Our analysis confirmed the higher expression of CCR6 and the coexpression of CD161 by Th17 cells already described by others (26, 33, 34, 35). CCR6 and CD161, alone and in combination, are currently used as markers for the enrichment of Th17 cells, however, both CD161+ and CCR6+ and even the double-positive cells can give rise to Th1 cells in addition to IL-17A-producing cells. In contrast, cells selected on the basis of high surface IL-17A generated only Th17 or Th1/17 clones, but never Th1 cells. 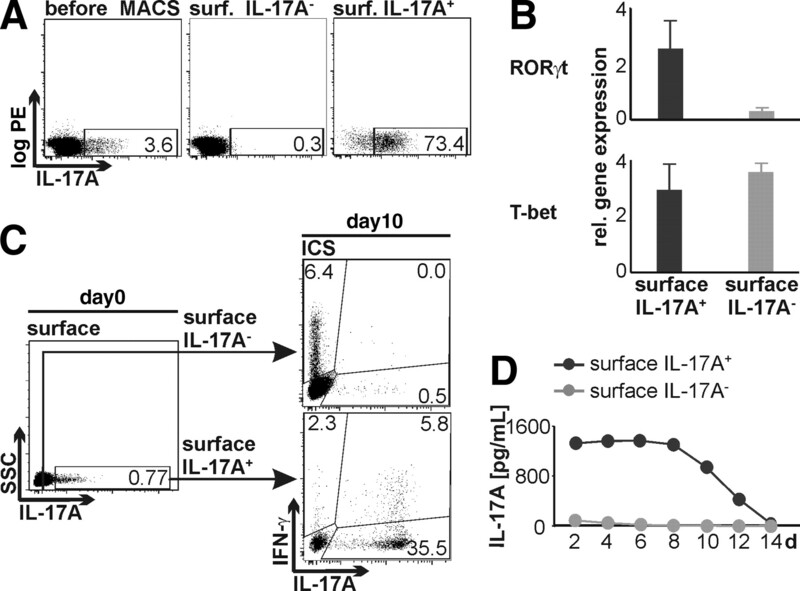 Very interestingly, the levels of surface expression of IL-17A seem to indicate the commitment to the Th phenotype: surface IL-17A− cells gave rise exclusively to Th1 clones; surface IL-17Ahigh cells produced mostly Th17 TCC and a few Th1/17 TCC. In contrast, sorting on the basis of surface IL-17Aint cells produced mostly TCC expressing both cytokines. When we analyzed the TCC for transcription factor expression, we found that RORγt was highly expressed in Th17 TCC and nearly absent from the Th1 TCC. T-bet, by contrast, was found at similar levels in Th1 and Th17 clones, indicating that T-bet is not exclusive of Th1 cells, in agreement with data showing that T-bet can directly regulate transcription of the IL-23R, and therefore influence the fate of Th17 cells (40). Interestingly, Th1/17 double producer TCC expressed higher levels of RORγt, IL17A, and IL23R, and also T-bet and IFN-γ mRNA than bona fide Th17 or Th1 cells, respectively. FoxP3 was again highest in this population, whereas GATA-3 showed similar low levels in all subsets. The high expression of Th1- and Th17-specific transcription factors suggested the capability of Th1/17 cells to differentiate into one of these T cell lineages. We characterized these clones assuming that they would show some plasticity in response to the provided cytokine milieu, and indeed we found that the presence of IL-12 drove cells to more IFN-γ production, as it has already been described (26), whereas IL-23 would preserve and increase IL-17A expression. These results demonstrate a certain degree of plasticity of human Th1/17 and also Th17 clones in response to the cytokine milieu. The mechanism of cytokine surface expression is not clear, because IL-17A does not harbor a classical transmembrane domain. The presence of IL-17A at the cell surface was only detectable a few hours after stimulation, and was blocked in the presence of brefeldin A, suggesting that the cytokine is actively transported to the cell membrane, where it stays transiently. Our data excluded the presentation of IL-17A on the surface by the known specific receptors, and the specificity of surface IL-17A expression by IL-17A-producing cells makes it unlikely that IL-17A binds nonspecifically to sugar moieties or other molecules on the surface of the cells. IL-17F has a transmembrane domain, is expressed by activated CD4+ T cells (our own data and Ref. 41), and it is present at the cell surface of cells previously sorted for high IL-17A expression. Thus, we suggest that IL-17A is displayed at the cell membrane forming a complex together with IL-17F, as it has been described for lymphotoxin α, which does not contain a transmembrane domain and it appears at the cell surface anchored via lymphotoxin β (42). A heterodimeric form of IL-17 comprising IL-17A and IL-17F and its biological function has already been described (7). The biological activity of this IL-17A surface form is still unknown, but it may have distinct functions, for instance it might serve as a ligand for IL-17R expressed on APCs to prolong cytokine signaling in T/APC clusters (43), or on endothelial cells (44). This may provide a cell contact-dependent signal for transmigration of surface IL-17A positive cells through vascular endothelial cells expressing IL-17 receptor (44). Our data show that surface IL-17A constitutes a unique marker for the unambiguous identification and isolation of viable Th17 cell. By analyzing phenotypically surface IL-17A+ CD4+ T cells, we show that human ex vivo Th17 cells express high levels of costimulatory and adhesion molecules as well as activation markers, indicating the potential of Th17 cells as potent effector T cells. In addition, we could consistently generate Th1/17 T cell clones derived from intermediate surface IL-17A-expressing cells, and these clones adapted their phenotype to the cytokine milieu, providing evidence for the plasticity of human Th1/17 cells. We thank all blood donors for their cooperation, Roland Martin for the support given to this project, Christoph Ogrodowczyk for help with the biotinylation experiments, and F. Koch-Nolte, F. Haag, and C. Stoeckle for suggestions and critical reading of the manuscript. ↵1 The Institute for Neuroimmunology and Clinical Multiple Sclerosis Research and this work are supported by the Hertie Foundation. V.B.-W. was partly supported by the German Research Council (SFB 685) and C.H. by the Research Focus Autoimmunity at the University of Lübeck. ↵3 Abbreviations used in this paper: TCC, T cell clone; MFI, mean fluorescence intensity; ICS, intracellular cytokine staining; PD-1, programmed cell death 1; TMHMM, transmembrane prediction using hidden Markov models; MINNOU, membrane protein identification without explicit use of hydropathy profiles and alignments. ↵4 The online version of this article contains supplementary material. Fossiez, F., O. Djossou, P. Chomarat, L. Flores-Romo, S. Ait-Yahia, C. Maat, J. J. Pin, P. Garrone, E. Garcia, S. Saeland, et al 1996. T cell interleukin-17 induces stromal cells to produce proinflammatory and hematopoietic cytokines. J. Exp. Med. 183: 2593-2603. Laan, M., Z. H. Cui, H. Hoshino, J. Lotvall, M. Sjostrand, D. C. Gruenert, B. E. Skoogh, A. Linden. 1999. Neutrophil recruitment by human IL-17 via C-X-C chemokine release in the airways. J. Immunol. 162: 2347-2352. Peric, M., S. Koglin, S. M. Kim, S. Morizane, R. Besch, J. C. Prinz, T. Ruzicka, R. L. Gallo, J. Schauber. 2008. IL-17A enhances vitamin D3-induced expression of cathelicidin antimicrobial peptide in human keratinocytes. J. Immunol. 181: 8504-8512. Li, H., J. Chen, A. Huang, J. Stinson, S. Heldens, J. Foster, P. Dowd, A. L. Gurney, W. I. Wood. 2000. Cloning and characterization of IL-17B and IL-17C, two new members of the IL-17 cytokine family. Proc. Natl. Acad. Sci. USA 97: 773-778. Lee, J., W. H. Ho, M. Maruoka, R. T. Corpuz, D. T. Baldwin, J. S. Foster, A. D. Goddard, D. G. Yansura, R. L. Vandlen, W. I. Wood, A. L. Gurney. 2001. IL-17E, a novel proinflammatory ligand for the IL-17 receptor homolog IL-17Rh1. J. Biol. Chem. 276: 1660-1664. Shi, Y., S. J. Ullrich, J. Zhang, K. Connolly, K. J. Grzegorzewski, M. C. Barber, W. Wang, K. Wathen, V. Hodge, C. L. Fisher, et al 2000. A novel cytokine receptor-ligand pair: identification, molecular characterization, and in vivo immunomodulatory activity. J. Biol. Chem. 275: 19167-19176. Wright, J. F., Y. Guo, A. Quazi, D. P. Luxenberg, F. Bennett, J. F. Ross, Y. Qiu, M. J. Whitters, K. N. Tomkinson, K. Dunussi-Joannopoulos, et al 2007. Identification of an interleukin 17F/17A heterodimer in activated human CD4+ T cells. J. Biol. Chem. 282: 13447-13455. Lockhart, E., A. M. Green, J. L. Flynn. 2006. IL-17 production is dominated by γδ T cells rather than CD4 T cells during Mycobacterium tuberculosis infection. J. Immunol. 177: 4662-4669. Rachitskaya, A. V., A. M. Hansen, R. Horai, Z. Li, R. Villasmil, D. Luger, R. B. Nussenblatt, R. R. Caspi. 2008. Cutting edge: NKT cells constitutively express IL-23 receptor and RORγt and rapidly produce IL-17 upon receptor ligation in an IL-6-independent fashion. J. Immunol. 180: 5167-5171. Cupedo, T., N. K. Crellin, N. Papazian, E. J. Rombouts, K. Weijer, J. L. Grogan, W. E. Fibbe, J. J. Cornelissen, H. Spits. 2009. Human fetal lymphoid tissue-inducer cells are interleukin 17-producing precursors to RORC+ CD127+ natural killer-like cells. Nat. Immunol. 10: 66-74. Liu, S. J., J. P. Tsai, C. R. Shen, Y. P. Sher, C. L. Hsieh, Y. C. Yeh, A. H. Chou, S. R. Chang, K. N. Hsiao, F. W. Yu, H. W. Chen. 2007. Induction of a distinct CD8 Tnc17 subset by transforming growth factor-β and interleukin-6. J. Leukocyte Biol. 82: 354-360. Ferretti, S., O. Bonneau, G. R. Dubois, C. E. Jones, A. Trifilieff. 2003. IL-17, produced by lymphocytes and neutrophils, is necessary for lipopolysaccharide-induced airway neutrophilia: IL-15 as a possible trigger. J. Immunol. 170: 2106-2112. Molet, S., Q. Hamid, F. Davoine, E. Nutku, R. Taha, N. Page, R. Olivenstein, J. Elias, J. Chakir. 2001. IL-17 is increased in asthmatic airways and induces human bronchial fibroblasts to produce cytokines. J. Allergy Clin. Immunol. 108: 430-438. Mangan, P. R., L. E. Harrington, D. B. O'Quinn, W. S. Helms, D. C. Bullard, C. O. Elson, R. D. Hatton, S. M. Wahl, T. R. Schoeb, C. T. Weaver. 2006. Transforming growth factor-β induces development of the TH17 lineage. Nature 441: 231-234. Yang, J., E. A. James, L. Huston, N. A. Danke, A. W. Liu, W. W. Kwok. 2006. Multiplex mapping of CD4 T cell epitopes using class II tetramers. Clin. Immunol. 120: 21-32. Wilson, N. J., K. Boniface, J. R. Chan, B. S. McKenzie, W. M. Blumenschein, J. D. Mattson, B. Basham, K. Smith, T. Chen, F. Morel, et al 2007. Development, cytokine profile and function of human interleukin 17-producing helper T cells. Nat. Immunol. 8: 950-957. Zheng, W., R. A. Flavell. 1997. The transcription factor GATA-3 is necessary and sufficient for Th2 cytokine gene expression in CD4 T cells. Cell 89: 587-596. Infante-Duarte, C., H. F. Horton, M. C. Byrne, T. Kamradt. 2000. 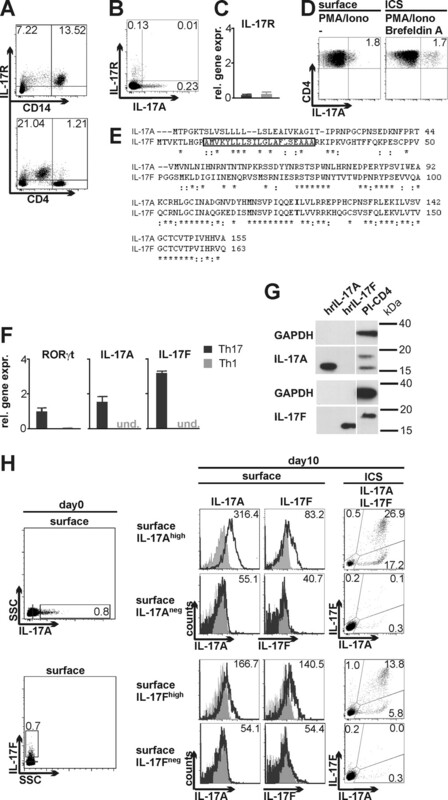 Microbial lipopeptides induce the production of IL-17 in Th cells. J. Immunol. 165: 6107-6115. Rudner, X. L., K. I. Happel, E. A. Young, J. E. Shellito. 2007. Interleukin-23 (IL-23)-IL-17 cytokine axis in murine Pneumocystis carinii infection. Infect. Immun. 75: 3055-3061. Kebir, H., K. Kreymborg, I. Ifergan, A. Dodelet-Devillers, R. Cayrol, M. Bernard, F. Giuliani, N. Arbour, B. Becher, A. Prat. 2007. Human TH17 lymphocytes promote blood-brain barrier disruption and central nervous system inflammation. Nat. Med. 13: 1173-1175. Tzartos, J. S., M. A. Friese, M. J. Craner, J. Palace, J. Newcombe, M. M. Esiri, L. Fugger. 2008. Interleukin-17 production in central nervous system-infiltrating T cells and glial cells is associated with active disease in multiple sclerosis. Am. J. Pathol. 172: 146-155. Sospedra, M., P. A. Muraro, I. Stefanova, Y. Zhao, K. Chung, Y. Li, M. Giulianotti, R. Simon, R. Mariuzza, C. Pinilla, R. Martin. 2006. Redundancy in antigen-presenting function of the HLA-DR and -DQ molecules in the multiple sclerosis-associated HLA-DR2 haplotype. J. Immunol. 176: 1951-1961. Muraro, P. A., M. Jacobsen, A. Necker, J. W. Nagle, R. Gaber, N. Sommer, W. H. Oertel, R. Martin, B. Hemmer. 2000. Rapid identification of local T cell expansion in inflammatory organ diseases by flow cytometric T cell receptor Vβ analysis. J. Immunol. Methods 246: 131-143. Ye, P., F. H. Rodriguez, S. Kanaly, K. L. Stocking, J. Schurr, P. Schwarzenberger, P. Oliver, W. Huang, P. Zhang, J. Zhang, et al 2001. Requirement of interleukin 17 receptor signaling for lung CXC chemokine and granulocyte colony-stimulating factor expression, neutrophil recruitment, and host defense. J. Exp. Med. 194: 519-527. Gelderblom, M., F. Leypoldt, K. Steinbach, D. Behrens, C. U. Choe, D. A. Siler, T. V. Arumugam, E. Orthey, C. Gerloff, E. Tolosa, T. Magnus. 2009. Temporal and spatial dynamics of cerebral immune cell accumulation in stroke. Stroke 40: 1849-1857. Sonnhammer, E. L., G. von Heijne, A. Krogh. 1998. A hidden Markov model for predicting transmembrane helices in protein sequences. Proceedings of the International Conference on Intelligent Systems for Molecular Biology; ISMB 6: 175-182. Cao, B., A. Porollo, R. Adamczak, M. Jarrell, J. Meller. 2006. Enhanced recognition of protein transmembrane domains with prediction-based structural profiles. Bioinformatics 22: 303-309. Singh, S. P., H. H. Zhang, J. F. Foley, M. N. Hedrick, J. M. Farber. 2008. Human T cells that are able to produce IL-17 express the chemokine receptor CCR6. J. Immunol. 180: 214-221. Cosmi, L., R. De Palma, V. Santarlasci, L. Maggi, M. Capone, F. Frosali, G. Rodolico, V. Querci, G. Abbate, R. Angeli, et al 2008. Human interleukin 17-producing cells originate from a CD161+CD4+ T cell precursor. J. Exp. Med. 205: 1903-1916. Liang, S. C., A. J. Long, F. Bennett, M. J. Whitters, R. Karim, M. Collins, S. J. Goldman, K. Dunussi-Joannopoulos, C. M. Williams, J. F. Wright, L. A. Fouser. 2007. An IL-17F/A heterodimer protein is produced by mouse Th17 cells and induces airway neutrophil recruitment. J. Immunol. 179: 7791-7799. Scheffold, A., M. Assenmacher, L. Reiners-Schramm, R. Lauster, A. Radbruch. 2000. High-sensitivity immunofluorescence for detection of the pro- and anti-inflammatory cytokines γ interferon and interleukin-10 on the surface of cytokine-secreting cells. Nat. Med. 6: 107-110. Assenmacher, M., A. Scheffold, J. Schmitz, J. A. Segura Checa, S. Miltenyi, A. Radbruch. 1996. Specific expression of surface interferon-γ on interferon-γ producing T cells from mouse and man. Eur. J. Immunol. 26: 263-267. Streeck, H., K. W. Cohen, J. S. Jolin, M. A. Brockman, A. Meier, K. A. Power, M. T. Waring, G. Alter, M. Altfeld. 2008. Rapid ex vivo isolation and long-term culture of human Th17 cells. J. Immunol. Methods 333: 115-125. Gocke, A. R., P. D. Cravens, L. H. Ben, R. Z. Hussain, S. C. Northrop, M. K. Racke, A. E. Lovett-Racke. 2007. 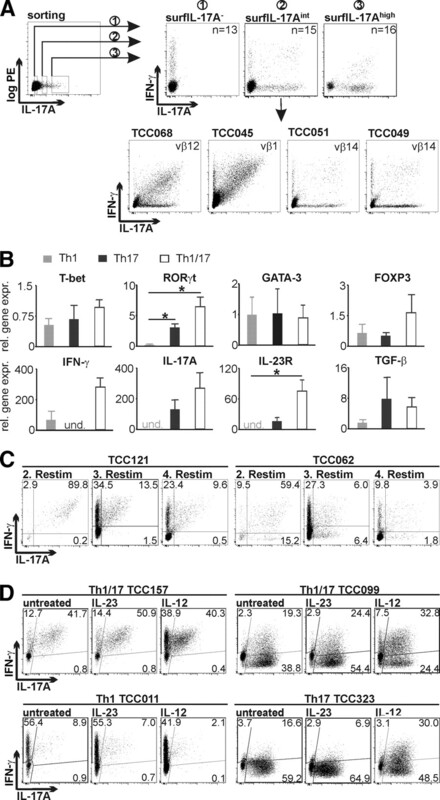 T-bet regulates the fate of Th1 and Th17 lymphocytes in autoimmunity. J. Immunol. 178: 1341-1348. Hymowitz, S. G., E. H. Filvaroff, J. P. Yin, J. Lee, L. Cai, P. Risser, M. Maruoka, W. Mao, J. Foster, R. F. Kelley, et al 2001. IL-17s adopt a cystine knot fold: structure and activity of a novel cytokine, IL-17F, and implications for receptor binding. EMBO J. 20: 5332-5341. Browning, J. L., A. Ngam-ek, P. Lawton, J. DeMarinis, R. Tizard, E. P. Chow, C. Hession, B. O'Brine-Greco, S. F. Foley, C. F. Ware. 1993. Lymphotoxin β, a novel member of the TNF family that forms a heteromeric complex with lymphotoxin on the cell surface. Cell 72: 847-856. Yao, Z., S. L. Painter, W. C. Fanslow, D. Ulrich, B. M. Macduff, M. K. Spriggs, R. J. Armitage. 1995. Human IL-17: a novel cytokine derived from T cells. J. Immunol. 155: 5483-5486. Moseley, T. A., D. R. Haudenschild, L. Rose, A. H. Reddi. 2003. Interleukin-17 family and IL-17 receptors. Cytokine Growth Factor Rev. 14: 155-174.